...is a unique organization located in Orange County California.The Centers director, Vicki Andersen started as a Veterinarian Assistant in the early 1970’s. After having three children she decided to put her career on hold. When the kids were mostly grown, she decided to go a little different route. After finding several small injured birds in her own neighborhood and having taken them to a rehabilitation center she became curious about their operations. She decided to sign up for classes and became a volunteer at a nearby rehab Center. One thing led to another and soon she was supervisor with an overwhelming interest and love for Songbirds. Soon she was made Songbird Specialist. Her own home is where she thought the birds could be cared for best, with their need for frequent feedings and delicate handling. Today, she along with her staff, volunteers and understanding husband rehabilitate about 400 Songbirds annually. 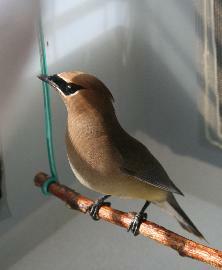 SCEC is a State and Federally permitted Wild bird Rehabilitation Center. SCEC is a non-profit California Corporation and an IRS recognized 501(C)(3) non profit charitable and educational Corporation, which is entirely supported by private and Corporate contributions and donations.